Yesterday I ended up in the south eastern corner of London in the randomly selected borough of Bromley. This is the big one. Bromley is the largest borough in the capital, greater in area than the eight smallest boroughs put together. A lot of it is green belt, and the southern fringe is unexpectedly rural and remote. The rest is classic suburbia, filled with two-car households, leafy avenues and the occasional commuter railway. It wasn't easy getting around, but I hope I managed to pick out several interesting parts of the borough all the same. There may be no tube stations in the London borough of Bromley, but there is an underground. 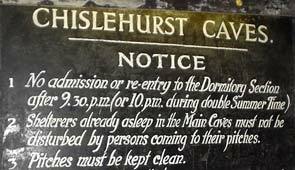 Twenty-two miles of underground tunnels, to be exact, carved into the chalk beneath Chislehurst Hill. Nobody's sure quite how long they've been there, but they're definitely not natural. Maybe the Druids built the tunnels as a temple, maybe the Saxons dug them to extract chalk and lime, or more likely post-medieval Britons came down here in search of flint for weapons. But the end result is a vast labyrinth of artificial catacombs - not so much caves as a network of interconnected mines. And, as you'll discover if you visit, thousands of wartime Britons had good reason to be thankful it was here. Your underground tour begins beyond the cafe and gift shop (cheques made payable to Kent Mushrooms Ltd) at the entrance to three interlinked cave systems. Adults get a flickering oil-lit lantern to carry, which adds greatly to the whole experience. Not far along the tunnels there's a fully consecrated 'church' (number of baptisms: one) and also a low stone concert stage. A surprising number of famous names once played down here, including Lonnie Donegan, Jimi Hendrix, David Bowie, Pink Floyd and some local lads called (appropriately enough) the Rolling Stones. On, deeper into the chalk hillside, with a succession of shadowy passages leading off in all directions. The guide may know precisely where he's going, but before long you'd not have a hope of finding your way out without him. At one of the deepest points, 30 metres beneath the local cricket pitch, there's a raised stone alcove which may (or may not) have been a Druidic sacrificial altar. In another cavern there's a pool of crystal clear water, dripped and filtered through the chalk above, which may (or may not) be haunted. And every now and then you pass a sign on a brick wall which reads "Ladies Toilets" or even "Citizens Advice Bureau", or something else equally incongruous. 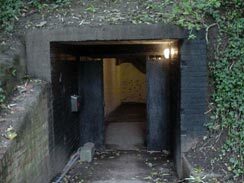 During the Second World War these caves were used as a vast underground shelter, and thousands paid a penny a night to sleep in bunk beds far from the bombs falling overhead. A subterranean settlement the size of a small town grew up, complete with its own canteen, barber shop and even hospital. It was stuffy and it was spooky, but at least it was safe. I enjoyed my hour-long tour of the caves far more than I was expecting. Most of this was thanks to our tour guide, a young black-clad gentlemen who'd clearly spent far too much of his life in the dark and who kept us entertained with dry wit and drama. It was also a masterstroke to be on the same tour as a group of teenage boys celebrating one of their number's 13th birthday - the perfect age for mixing bravado, awe and downright terror. Judging by the way these lads attacked the gift shop afterwards, I wouldn't be at all surprised if a couple of them started turning goth within weeks, then came back to play real-life role playing games in the tunnels at weekends. If you own some wide-eyed adolescents who need to be kept occupied for an hour, or if you just fancy a bewitching Hallowe'en-tide day out, I'd heartily recommend a visit.